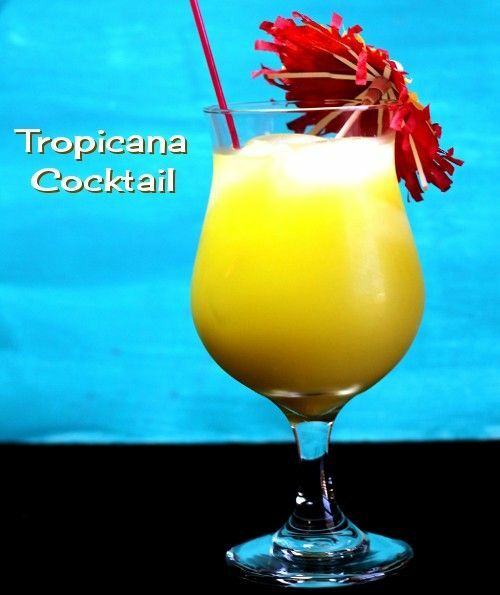 There are a number of cocktails out there calling themselves the Tropicana, but this is the recipe that calls for a touch of creme de cacao. Oh, yes – this one is different from the others. The overall flavor here is fruity, but it definitely has that kind of flavor that you have to think about a little. There are notes of melon, chocolate and citrus, and then the soda water gives it that wonderful fizz. Fill a cocktail shaker with ice. Pour everything but the soda water into it and shake. Pour everything – ice included – into a highball glass and fill the rest of the way with soda water.